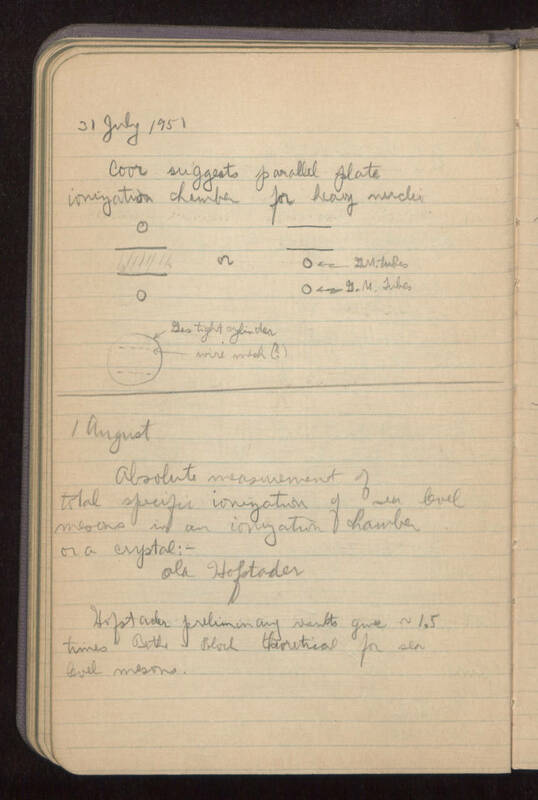 31 July 1951 Coor suggests parallel plate ionization chamber for heavy nuclei [sketches/pictures] drawings comparing placements: chamber between G.M. tubes, G.M. tubes on one side only [sketch/picture] cross-section drawing of "gas tight cylinder" with interior "wire mesh (?)" dividing-walls seeming to create 3 areas ---------------------------------------------------------------------- 1 August Absolute measurement of total specific ionization of sea level mesons in an ionization chamber or a crystal: -- ala: Hofstader Hofstader preliminary results give ~1.5 times Bethe [Bloch? Block?] theoretical for sea level mesons.